There looks to be another way of possibly platter removal for motor damage. This is useful for drives that have platters with spacers we have all had some problems with. I have heard these discussions for about a year now, but this is the first idea that seems to have a possible professional tool. The idea is to attach the tool to the top of the platters with screws and use the spindle extraction pin in the center to unclip and remove the whole spindle holding the platters in the air. Again this thing looks rather expensive… I heard a number £6,500 – which if I did this right, will be about $10k in USD. Someone sent me this info, don’t know if they want me to mention their name, if they do they can speak up, if not… thanks! 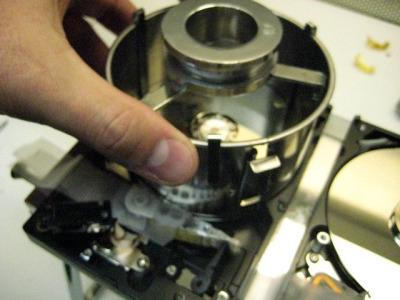 As you can see the SERT solution is made up of various parts, it provides a mechanism for the removal of platters that include spacers and a spindle extraction and replacement technique. Resulting in a tool that can recover data from drives that were previously irrecoverable! SERT (Spindle, Extraction and Replacement Tool) has become an overnight success! Many clients have placed their order before the demonstration event in February. The event will include two demonstrations of the SERT tool and the technique which will give you the opportunity to take a closer look at the recovery process. to attend the event please register your interest by clicking on the link below.